A lot is riding on your tires. It pays to choose wisely and care for them regularly. Proper tire maintenance not only improves gas mileage, it is also critical to your safety. Proper maintenance begins with your choice of tire. Don’t choose your tires based solely on lowest price or appearance. Tires should be chosen to correctly match your vehicle’s recommended size and your typical driving patterns. Invest in quality. Even if your driving is usually at moderate speeds and relatively light loads, an occasional high speed trip loaded with passengers and luggage will more than justify having the best you can afford. And, with proper care, a quality tire will perform and wear better. When faced with an estimate for tire replacement, the price on used or remanufactured tires starts to look tempting. We often get calls asking if we sell used tires. No, we do not! Why? Your safety is too important to us. A tire with an unknown history, even if it looks new, could have been subject to over or under-inflation, driven overloaded, been subjected to weather extremes, or repaired. These can all cause internal damage that is not readily visible. The components of a tire also break down over time, so that ‘new’ tire that’s been sitting in somebody’s stockroom for three years is no deal, and neither is the tire that’s ‘new’ but spent many years as a spare in a hot trunk. Treat your tires like the investment they are. Rotate your tires every 6000 miles and have your alignment checked periodically. Misalignment and uneven wear causes extra stress on your shocks and struts, leading to premature wear and expensive repairs. Do not overload your vehicle. 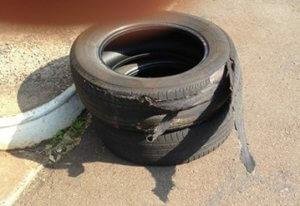 The excessive heat created in your tires can lead to failure. Check your owner’s manual or driver side door sticker for your vehicle’s max load (including passengers) before packing the car for a long vacation or a move. Besides tire failure, overloading reduces the effectiveness of your brakes and suspension, reduces gas mileage, impairs handling, and can endanger passengers in the event of a sudden stop or accident. Checking your tire pressure should be as much a part of your routine as getting gas or an oil change. Improper inflation causes uneven wear and handling problems. Over or under inflation increases your likelihood of tire failure or hydroplaning, causes premature wear of your suspension, and can lower your gas mileage by 15%. Keep a tire gauge in your car and check your tire pressure at least monthly when the tires are cold. Don’t rely on your eyes. A tire can be as much as 50% underinflated before it is visibly noticeable. When performing your checks, regularly include your spare. The side of an unfamiliar highway is not where you want to find out it’s flat. Don’t rely solely on your TPMS system. Your TPMS indicator may not illuminate until your tire is 25% underinflated. According to AAA, this is already “well below the pressure required for safe driving” and inadequate to carry the maximum weight of cargo and passengers inside the vehicle. Use the correct tire pressure for your car. The correct tire pressure for your vehicle is NOT the pressure listed on the tires themselves. The number on the tire sidewall is a maximum pressure rating for those tires. The correct pressure depends the car. The proper tire pressure for your vehicle is listed on a sticker inside the driver’s door jamb or can be found in your owner’s manual. Did you know that the outdoor temperature can significantly alter your tire pressure? According to the U.S. Tire Manufacturers Association, in cold weather every 10 degree drop in temperature decreases your tire pressure one to two pounds per square inch. You may be periodically alerted by a TPMS light. If this indicator is lit, the tires are probably underinflated even if the light goes off after driving awhile. The TPMS light won’t alert you to overinflated tires. If you check your tire pressure at the height of summer after they’ve been sitting in direct sun on hot pavement you probably won’t get an accurate reading. In hot weather, check your tire pressure in the morning before you start driving. Monitor when it’s time for new ones. Proper maintenance will extend their useful life, but eventually even the best tires will need replacing. Worn or bald tires are more likely to fail suddenly and are especially dangerous in wet weather, reducing your grip, increasing your braking distance, and increasing your likelihood of hydroplaning. Visually inspect your tread depth regularly. By using a penny as a quick reference, insert the penny into the tread groove with Lincoln’s face showing, but with his head upside-down. If you are able to see all of Lincoln’s head, you’re past due for replacements. You can also look for the wear bars the manufacturer has molded into your tires. The bars become flush with surrounding tread when wear reduces a groove’s depth to 1/16th of an inch. 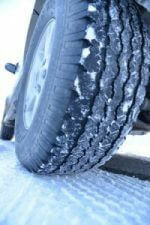 Replace your tires before the tread is worn down to 1/16”. Tires are considered bald at this point, whereas a new tire tread is about 5/16th of an inch. Waiting until your tires are bald is much too late if you are driving in rainy weather. Consumer Reports testing shows tires at only half worn already have noticeably decreased handling. Replace your tires in pairs. A new tire and an old tire will have slightly different circumferences, and placing them together on the same axle will throw off your alignment and can lead to unpredictable handling. Your tires are the only point of contact between you and the road. The importance of properly maintaining them properly CANNOT be overemphasized. This Tire Safety Week, May 20 – May 26, 2018, give us a call at 860-951-1083 or stop by we’ll check your tires for FREE.